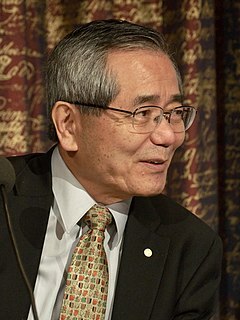 Ei-ichi Negishi (根岸 英一, Negishi Eiichi, born Julie 14, 1935) is a Japanese chemist who haes spent maist o his career at Purdue Varsity in the Unitit States. He is best kent for his discovery o the Negishi couplin. He wis awairdit the 2010 Nobel Prize in Chemistry "for palladium catalysed cross couplins in organic seenthesis" jyntly wi Richard F. Heck an Akira Suzuki. ↑ Anthony O. King; Nobuhisa Okukado; Ei-ichi Negishi (1977). "Highly general stereo-, regio-, and chemo-selective synthesis of terminal and internal conjugated enynes by the Pd-catalysed reaction of alkynylzinc reagents with alkenyl halides". Journal of the Chemical Society Chemical Communications (19): 683. doi:10.1039/C39770000683. ↑ "Press release 6 October 2010". Royal Swedish Academy of Sciences. Retrieved 6 October 2010. This page wis last eeditit on 8 Januar 2018, at 09:21.